You are here: Home / Game Recaps / 2010 Game Recaps / Manitoba Meltdown: Lions implode in the 4th and lose to Bombers. 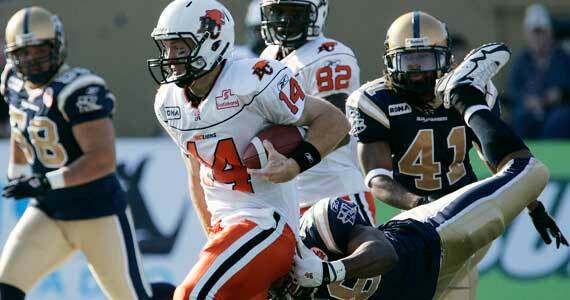 Manitoba Meltdown: Lions implode in the 4th and lose to Bombers. The BC Lions held a 21 point lead in the second half and ended up losing in overtime to the Winnipeg Blue Bombers 47-35, and missed a huge chance to put a stranglehold on a playoff spot in the process. What was responsible for the Manitoba meltdown? Untimely penalties, undisciplined play, poor special teams and the inability to move the ball in the 4th quarter all played roles in the most disappointing loss of the season to date. Both teams started slowly on offense, and for awhile those suffering from an overdose of turkey induced comas had little hope for a remedy from watching this game. With the score 11-8 at halftime, and the Winnipeg faithful having little faith in QB Alex Brink, the Lions started to put some things together, an were spraked by yet another highlight return by Yonus Davis, who gave the Lions a 15-11 lead with a 73 yard punt return. A botched fake punt set the Lions up in the redzone and Travis Lulay found Geroy Simon in the endzone and then found Emmanuel Arceneaux to put the Lions up 32-11 heading into the fourth quarter. But with Lulay finding a rhythm, he was forced to leave the game with an injury to his right hand, and Casey Printers entered the game to hopefully take the win home…yeah, no. Trailing 32-11 heading into the fourth quarter it was Winnipeg QB Steven Jyles who entered the game, and who would guide his team to a win with his team on playoff life support. The fans had been calling for Jyles after Brinks was continually ineffective. Jyles got the team in position to get a 45 yard field goal, then found Terrence Edwards in the endzone to cut the Lions lead to eleven points. Following that TD, Davis Sanchez lost it and racked up 25 yards in penalties and the Bombers easily added a single on the ensuing kick off cutting the lead to ten. You could feel the game slipping away from the Lions, and Casey Printers had no response leading the offense. Jyles would find Greg Carr in the endzone late, cutting the lead to three at 32-29 with under a minute to play. All the Lions really needed was a deep kick, some solid special teams and a stop or two and the game was over. Instead, Jovan Johnson took the kick off into Lions territory, setting up a 43 yard Justin Palardy field goal to send the game to overtime and sending the Winnipeg crowd into a frenzy. The Lions could only manage a Sean Whyte field goal after procedure penalties hindered any progress the Lions could make. Then, with the Lions defence on the field, the Bombers appeared to be taken out of field goal range on a sack, but Khalif Mitchell was ejected from the game after losing his cool and punching a Bomber player in the pile. The mental mistake cost the Lions dearly, as the Bombers tied the game with a field goal of their ow and the teams went to the second half of overtime tied at 35-35. The Bombers had the ball first and drove for a touchdown, missing the two point convert. The pressure was on the Lions, and QB Casey Printers, and more penalties hampered the offence. In the end facing a second and long, Printers threw an ill advised ball that was picked off by Deon Beasley and returned for a touchdown, also returning the playoff hopes of the Bombers in the process. One would hate to be a player in the Lions locker room following the game as they have no one to blame but themselves for the meltdown. What was more disappointing was the people taking the penalties. Veteran’s like Sanchez who need to be leaders have to be smarter and more composed. Travis Lulay started slowly, but used his feet well. He was 13/22 147 yards and no interceptions. He did have a couple of fumbles. The Bombers started Alex Brink in a controversial move, and they nearly paid for it. They gave the QB plenty of time to find his way, much to the displeasure of the Bomber faithful. He finished 4/18 for 61 yards before being pulled. Angus Reid left the game in the 4th quarter, an injury that could have huge ramifications to the offence next week if he can’t go. Being a short week, it appears Justin Sorensen could be the centre against Edmonton. The Lions missed a huge chance to secure a playoff spot with the loss. Had they won, they would have been two games up on Edmonton and three up on the Bombers in a crossover scenario, making next week’s home game versus the Eskimos huge. Geroy Simon’s touchdown was the 90th of his CFL career.